We’re going to use Canva to create our graphic. 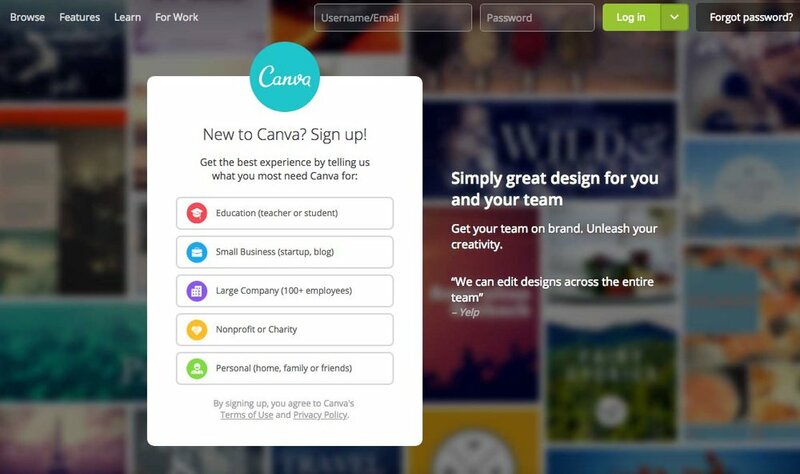 Canva is an online design program, it’s free, and once you find your way around, it’s super easy to use. While not all of the elements within Canva are free, most are $1 each. If you’re creating a graphic for your website and a grand piano illustration is $1, that’s a pretty great deal. We’re not making a logo (although this would be the place to do it), but the logo template provides a good starting point for a simple graphic. You can see a variety of pre-designed logo layouts on the left. We’re going to ignore those layouts and just use the blank box. On the far left-hand side, you’ll see a column of editing tools. → Select the “elements” option. → From elements, choose the “shapes” box. → Click on the first solid white circle that you see. It should appear as a black circle on your canvas. → Change the color by clicking the small black square in the upper left corner of the screen. You can choose from one of the colors you see, or click the “+” button to create a custom color. Above the shapes that appeared on the left side of your screen, you’ll see a search field. → In the searchfield at the top, type “piano.” You’ll see a mix of photos and illustrations come up. → Right below the search field, select the word “illustrations” to narrow your choices. → Scroll down until you find a piano image that you like. I chose a simple grand piano graphic. Note: Look for images that are either free or $1. The images marked “pro” require a monthly subscription - which, by the way, is totally worth it if you use graphics frequently. 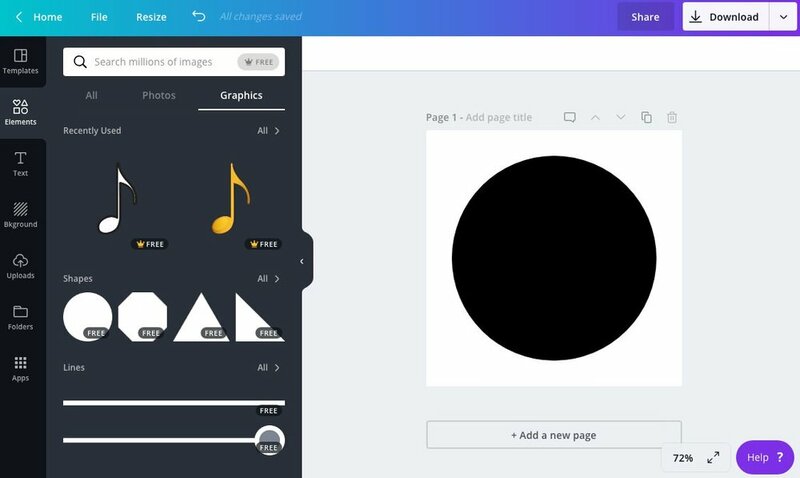 → Click on the piano image you want to use, then resize it to fit your circle by grabbing a corner of the frame around the piano and dragging. → Since we’re going to use font on top of the piano image, we need to fade the piano so it doesn’t clash with the words. Locate the transparency slider and move it to the left. Slide it to around 55%. To add text, select the “Text” button in the toolbox (the left side of your screen). You’ll see lots of options come up for text design. → Change the font to “Playlist Script” in the drop-down text menu. → Change the size to 104 and adjust the width of the text box as needed. → Now grab the whole text block and center it on the piano. → We want less space between the two lines of text, so select “spacing” in the top white menu. Move the “line height” slider down to 1. → Change the color of the text. Tip: When you’re centering text or images, watch for the vertical dotted purple line to appear through your design. This indicates that the design is centered. The line will appear horizontally, as well, when centering images top to bottom. At this point, I like to tweak the placement and size of everything to be sure I like the combination. Next, click the “Download” button in the top blue menu bar. I'd recommend downloading your design as a PNG file, and you can select that here. If you’re using a paid element in our design, Canva will ask for your payment information prior to finishing your download. Note: You have 24 hours to download the image you purchased as many times as you want. After that period of time, you’ll need to pay if you want to download the piano graphic again. I like to keep all of my downloaded Canva designs in a file on my desktop for future use. Congratulations! 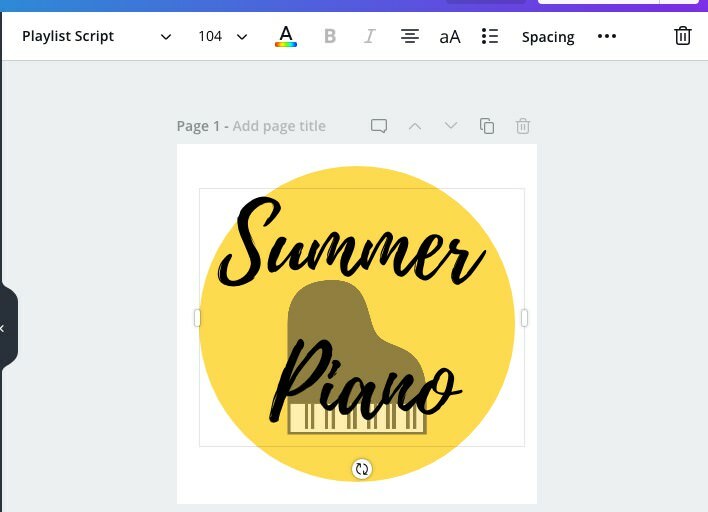 Not only have you created your first graphic in Canva, you now have the tools to create a wide variety of designs. You know what to do now: PRACTICE. Is Canva a tool that will be useful for your studio? What else would you like to be able to design in Canva? Do you have any questions about creating designs in Canva?